“Interview” sounds so formal. This is more of a conversation—a chance for you to talk to an interesting, knowledgeable person about your future. We can talk on campus, near your hometown (thanks to our alumnae network), or through the magic of a video conferencing app. Applicants may have only one interview. If you have had or plan to have an on-campus interview, please do not request an off-campus interview, and vice-versa. If you’re interviewing on campus, you’ll talk with a trained senior student. 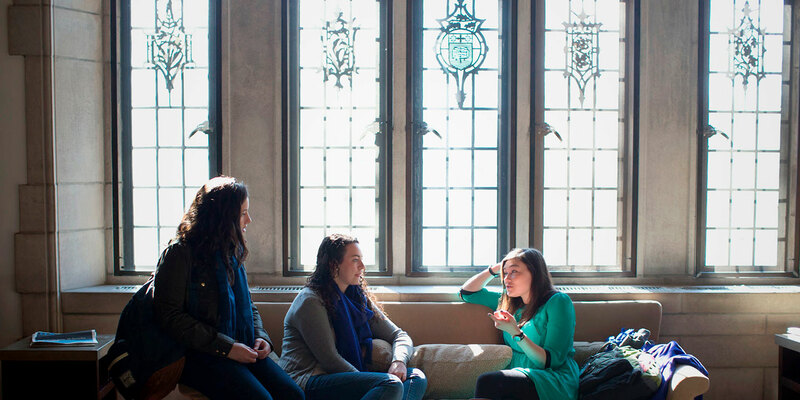 If you’re interviewing off campus, you’ll talk with a trained alumnae volunteer. Either way, you’ll be having a conversation with a smart, engaged person who wants to know more about you. We’ll talk about what excites you, what you’re most looking forward to in college, how you like to learn, what you do for fun, and how Wellesley might match your goals and interests. We won’t read from a script, we don’t have a formal list of questions, and we’re not looking for “right” answers. This is basically a getting-to-know-you session: You’re getting to know Wellesley, and we’re getting to know you. Important note: You don’t need to wear a suit or bring a resume to impress us. An interview is required for Davis Degree candidates. A phone interview with an admission counselor is required for all postbaccalaureate candidates. To schedule an interview, contact Molly Morrow, senior assistant director of admission, at 781-283-2270 or admission@wellesley.edu. Fall entry: You must request an interview by February 15. Spring entry: You must request an interview by October 31. If you can’t come to campus, request an off-campus interview with an alumna near your hometown, if one is available). Otherwise, we’ll coordinate an online interview. For the best selection of dates, book your interview at least two weeks in advance. See our calendar below for the dates we offer interviews (based on your application type). Then book your appointment to view exact availability and to register for a specific time.